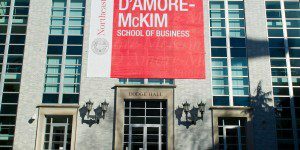 Northeastern University full-time MBA at D’Amore-McKim School of Business is intended to be completed within two consecutive academic years, including a six-month paid corporate residency and a global consulting project. The 60-credit Northeastern University full-time MBA program begins with MBA foundation courses and a career management course. Students fulfill their globalization requirement during their first year through the Global Projects consulting course, a field-based experience overseas. Students also take a non-credit Career Management course and a MBA Skills Workshop as prerequisites for the corporate residency program. The courses prepares students for the career planning process by covering topics such as résumé writing, mock interviews, job search strategy, salary negotiation, communication skills, business analysis, ethics, etc. Between their first and second years, students take a three unit course called the Global Project Consulting Course. The course includes pairs students up with a global partner organization to solve problems based on current issues. The class also includes a trip abroad to give students hands-on experience working in an international capacity. On each trip, students attend talks by guest speakers, meet with regional officials, and visit various business firms in order to gain practical exposure to the global business theory taught in the classroom. They spend the rest of the summer and the following fall semester—June through December—in their Corporate Residency, a six-month paid internship with one of Northeastern’s corporate partners. When they return from their Corporate Residency, students begin taking electives to earn two different concentrations, each requiring 12 credit hours of courses. Students can choose between Business Analytics, Corporate Innovation and Venturing, Entrepreneurship, Finance, Healthcare Management, International Business, Leading People and Organizations, Marketing, and Supply Chain Management. The Northeastern University full-time MBA class currently enrolls 166 students. Those enrolled scored a 633 on the GMAT and earned an average undergraduate GPA of 3.34. About 43 percent of the classes are female, with international students comprising 38 percent. Around 91 percent of Northeastern University full-time MBA students started jobs within three months of graduation. Graduates earned an average salary of $89,243 with a top base salary of $128,000. The Northeastern University full-time MBA program costs $1,600 per credit hour. The total cost for the program is $96,000 (60 credits). Full-time students at the Boston campus pay $560 in fees. All admitted students are automatically considered for a scholarship; no separate application is necessary. Scholarships range from 25 percent to 100 percent of tuition and are based on undergraduate record, professional experience and recommendations, GMAT score and other relevant application materials. Applicants must have a bachelor’s degree. Applicants must submit a completed online application, two letters of recommendation, a professional résumé, transcripts from each college or university attended, GMAT or GRE scores, personal statement, and a $100 application fee. International students from non-English-speaking countries must also submit score reports from the TOEFL, IELTS or PTE Academic, and non-citizens who are permanent residents must submit their Green Card. An interview is required for admission and is extended by invitation only. All applications submitted after April 15 will be reviewed on a rolling basis.